Steps to the beach! Two pools! Oceanfront bldg in Wildwood Crest Fun!! 1-bedroom, 1-bath oceanview unit (sleeps 5) in YEAR-ROUND beachfront complexSpectacular views just steps to the beach from this 1-bedroom, 1-bath unit in the Summer Sands beachfront condo complex. The complex features two heated pools (open late May thru mid Sept) and five sun decks. Unit 408 is on the 4th floor at the beach end of the complex for prime views from either the chairs out front or the living room. Tastefully deccorated in seashore contemporary, the unit sleeps 5: bedroom features a king-size bed and a twin bed, and the living room has a full-size sleeper sectional. Free Wi-Fi included! Cable TV and DVD players in bedroom and living room. Attention allergy sufferers: No carpeting! Tile floor in living room, kitchen, and bath; Mannington Adura floor in the bedroom. Updated kitchenette with full-size fridge, two-burner cooktop, microwave, coffee maker, toaster, blender, pots, pans, dishware, glassware, flatware, etc. Complex also offers 6 gas grills for use by guests. On-site professional property management and maintenance staff (May-Sept.). 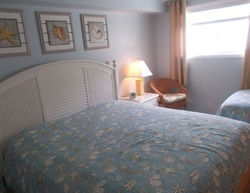 Wall AC/heater unit plus ceiling fans in the living room and bedroom for comfort in this YEAR-ROUND unit ideal for the many post-/pre-season events that take place at the Wildwood Convention Center and Cape May. Reserved parking (minivan or smaller vehicle; full-size extended-bed pickups, Suburbans, etc may not fit, depending on surrounding vehicles). Coin-op laundry room on the 4th floor. Tenants are responsible for bringing their own bed linens and towels (contacts for local linen rental companies available upon request). Three-night minimum stay required (with some flexibility based on availability); in prime season (July-Aug) unit only rents for the full week Sunday-to-Sunday. Please note that at least one guest in a rental party must be at least 25 years old.